I came across a small app known as GTalk Auto Reply which allows you to set an automated message in Google Talk when you’re away. This automated message is displayed whenever any of your friends sends you a message. It’s quite small in size (around 1MB) and has an extremely user friendly interface. 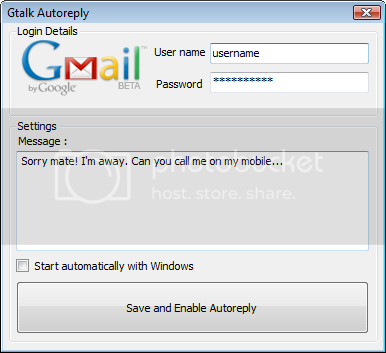 After downloading GTalk Autoreply install it and run it. You’ll see a box like the one shown above. Enter your username and password. Type an auto reply message and click on ‘Save and enable Autoreply’. Now whenever your friend sends you a message, the automated message you entered earlier is displayed.